Yuzuki Murakami was born in Miyazaki, Japan. She made her stage debut when she was 2 years old. 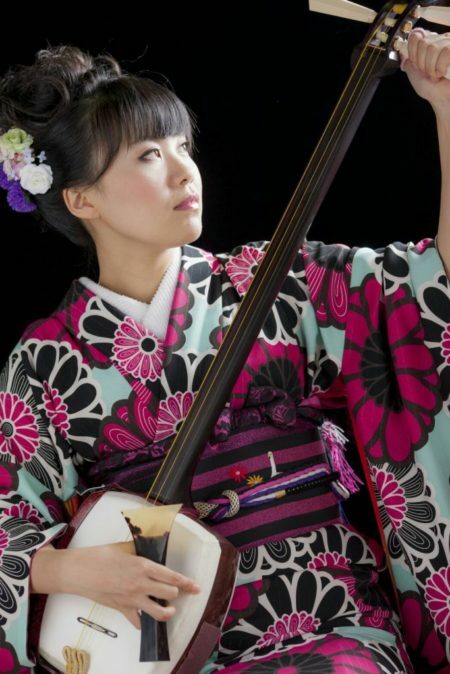 She plays not only shamisen but also Japanese flute and drum. She sings traditional Japanese songs and plays Western music as well. She also works as a radio personality and create new music to breathe new life into traditional music circles. Music pieces she arranges for the school concerts based on school songs and requests are receiving critical acclaim. Murakami Sangendo teaches not only shamisen but also drum, other instruments, and singing. We have varieties of students from 3 years old to 90 years old. We have many students who are aiming at becoming professional artists and teachers, as well as those who are learning shamisen for their stress relief and well-being, and play the instruments for volunteer activities. You can refresh your mind through Japanese traditional music. Please do not hesitate to contact us. Copyright (C) 2017 Yuzuki-murakami.com. All Rights Reserved.